Fresh oven-roasted turkey, dill Havarti cheese and lettuce is stacked on our hearty harvest wheat bread, then topped off with a scallion mayo. Yum. 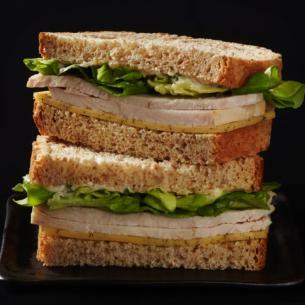 roasted turkey breast (turkey breast, water, contains 2% or less of: salt, turbinado sugar, natural flavoring), harvest wheat bread (water, enriched flour [wheat flour, malted barley flour, niacin, reduced iron, thiamine mononitrate, riboflavin, folic acid], cracked wheat, whole-wheat flour, granulated sugar, fully refined soybean oil, yeast, dried wheat sourdough, wheat flour, natural flavor, contains 2% or less of: canola oil, enzymes, salt, wheat gluten, malted wheat flour, ascorbic acid), dill havarti cheese (pasteurized milk and cream, cheese culture, salt, dill, enzymes, annatto [color]), scallion mayonnaise spread (mayonnaise [soybean oil, water, whole eggs and egg yolks, vinegar, salt, sugar, lemon juice, calcium disodium edta (used to protect quality), natural flavors], scallions, lemon juice, lemon zest, black pepper), lettuce. Celebrated at Thanksgiving, but neglected most of the year, the humble turkey warrants a higher profile in our diets, we think. This is just the sandwich to help you honor this tasty bird. Featuring carved oven-roasted turkey, it comes with plenty of trimmings: dill Havarti cheese and lettuce with scallion mayonnaise, served on hearty harvest wheat bread. Go ahead and gobble. If Benjamin Franklin had his way, the wild turkey – not the bald eagle – would be America’s national bird.